One of The Reader Organisation’s largest strands of work is reading regularly with people living with dementia, and we currently have opportunities for people to get involved in volunteering sharing reading in this area across all three of our projects in Barnet and Brent, North London. “Somehow, her Alzheimer’s made her more open, more truthful. There’s a kind of odd poetry in dementia that picks out jagged, glittering pieces of truth and makes you have to reassemble them”. We currently have 17 weekly shared read aloud reading groups spread across both Barnet and Brent, and these take place in both community and care settings. Our groups range from dementia friendly community groups to groups with members in advanced stage dementia, where people still recognise words and lines from poems both old and new. Through our groups our volunteers are saying to people with dementia and their carers that we value them. By reading with people who may often feel lonely, isolated or frustrated, we take them out of themselves through the stimulation of the book or poem. Opportunity and space is created for the participants to reflect on their life experience, via memories or emotions evoked by the poem or story. Our successful model does not set boundaries in what is possible for people with memory impairment. Through our groups the participants remain creative, engaged and are enabled to better express themselves. In our reading sessions we introduce quality literature, and this is often poetry with its compressed language, content, rhythms and rhymes. The conversations that emerge and the smiles that arise out of our reading sessions allow the readers in our dementia group settings to gain freedom, confidence and laughter in place of confusion and confinement. In dementia linear, controlled time ceases to exist. Connections are made, lost and remade, and found again, continually inside the now of dementia. However, in our groups using our shared read aloud model, the same mind that cannot remember to eat or go the toilet can hold on to the lines of a poem. This fluidity of time is just one reason that our shared reading projects work for people with dementia. Language is more than words. It is a moment in time that is held in a handful of words and a certain rhythm. All of the emotions connected to the poems that we read together awaken feelings and thoughts in the present, within the session and within the moment. Our reading model also allows renewed connections to words as expressive language. 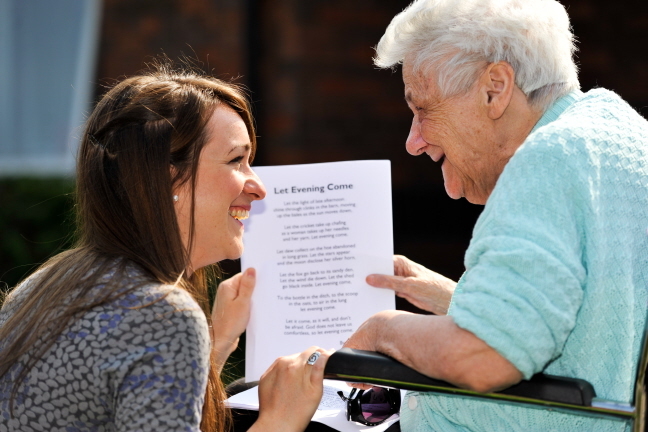 Whilst the language centres of the brain can be severely affected by the disease processes in many types of dementia, poems and stories can allow someone to connect to words as a means of expression. Feelings and ideas can be shared through the words in the poem. These feelings or ideas might not find any expression in words if the person were left to attempt to put the words together for themselves. Our warm and kind sessions delivered by trained volunteers provide a bridge back to expression in language again. This is a call to care. A call to bring beauty, humour and meaning to people who are living with Dementia through the power of poetry and prose brought alive in the present moment of the weekly reading session. Come and bring the reading revolution to more Older People in North London by volunteering with The Reader Organisation. I first heard about The Reader Organisation through a request for volunteers sent out by Jewish Care for whom I already volunteer. I met with Paul, the local co-ordinator, and was immediately enthused. I love poetry and the concept was something new. To be reading with people living with dementia was such a wonderful opportunity not just for those I would be reading with but very much on a personal level – to feel I was being of use to the community in a way that would give me immense pleasure. The training was so interesting; I met some wonderful people who would be working in all different kinds of environments. The trainers were inspiring and incredibly motivating; they provide a wealth of ongoing support and advice. Putting the model into practice was easy; the system is tried and tested and really works extremely well. After my first couple of sessions with a wonderful group of seniors I soon got into the swing of things and I really look forward to each session. No two weeks are the same. There is such a huge source of material from hundreds of years of poetry and prose; it really isn’t difficult to find 2 or 3 pieces each week which will bring members of the group to life in some way – to laugh together, be sad and reflective together – to communicate on whatever level is such a privilege to be the initiator of.